I always enjoy the feedback I get from my patients. It helps me to improve my skills on all levels. I love Acupuncture, Thermography, Electro Sound Lymphatic Drainage, Herbal Medicine and all the other healing modalities that I practice. 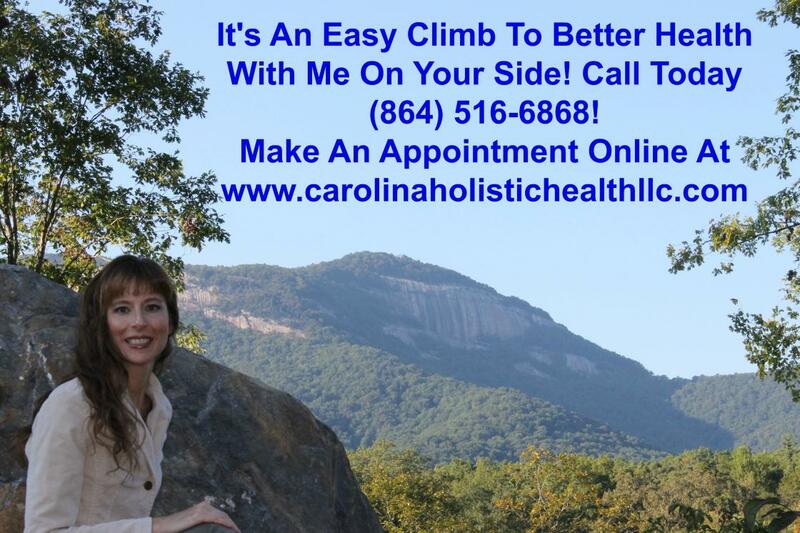 At Carolina Holistic Health, I continue to expand my knowledge and therapies offered in order to provide the most effective solutions to all of your health challenges. As always, the best compliment I can receive is a referral from someone you care about. If you have questions, please feel free to email me at tcmdoc29@yahoo.com and include "blog" in the subject line. I am going to share some of those testimonials with you now. I was unable to become pregnant for at least 6 years. I had tried 3 different types of fertility drugs with no success. I went to Acupuncture and it worked for me. It took only around 5 months to get pregnant. I have a miracle baby girl now. Acupuncture works for infertility. I initially started seeing Christina when I was diagnosed with endometriosis and adenomyosis. My ob-gyn had told me that the only options I had for relief from my problems were a hysterectomy or birth-control shots. I was 40 years old and neither of these options sounded good to me, so I decided to try an alternative route (which by the way, my doctor supported and was glad to hear of another option). Not only did she help me with this, but since then (as I have continued seeing her for other things), she has helped me shrink a goiter, deal with anemia, heal back problems and a sprained ankle after a bad fall as well as get over other little things like colds without taking medications that just mask symptoms. I go to a doctor who knows I see Christina and is willing to work with her because he is genuinely interested in my being well -- not just trying to make money off of my being sick! Many thanks to Christina for all she's done! Thermography was crucial in restoring my quality of life. I had spent several months suffering from severe joint pain. The MD analysis of my thermal imaging combined with a list of symptoms and lab work suggested rheumatoid arthritis. The herbal supplements given to me relieved my pain in just a few weeks! ~B.P. As a person with an extremely low pain tolerance level and a somewhat skeptical frame of mind, I attended my acupuncture consultation as a last ditch effort to deal with a debilitating depression and anxiety disorder. Immediately I was impressed with Christina’s calm demeanor and knowledgeable touch. Any preconceived notions of painful procedures and torturous needle pricks were dispelled within the first ten minutes of my session. After my first session, I was able to feel immediate results. I slept better than I had in over a year. My energy level increased. My anxiety lessened and my ability to handle stress effectively improved. Christina’s true commitment to patient wellness is evident in every aspect of her character. She is a wealth of knowledge that she is willing to share for the betterment of the patient. Without question, the services offered have enriched my life and improved my well being. ~Amanda H.
I have been in excruciating pain for weeks. One visit to Christina and I am almost 100% pain free. I'm looking forward to the follow up visits. Christina is knowledgeable and thorough in her treatments, takes her time, and is very professional. I am excited about how I feel! Christina provided acupuncture for my 7 year old and acupressure for my 5 year old. She made both of them feel so comfortable and they love going to see her! We are really happy with the results! Thanks Christina! If it weren't for Christina I wouldn't walk without pain. She has helped my arthritis tremendously. I am now walking pain free! I truly recommend her!!! Christina is very professional and knowledgeable about health in general and Chinese Medicine, Acupuncture, and Thermography in particular. What a great idea to use the info gained from Thermography to guide a customized care program. Christina put me at ease and impressed me with her knowledge and expertise. I have signed up for a course of treatments with her. Don't know how I would have survived without Acupuncture and its wonderful practitioner Christina. I depend wholly upon her. She has rectified so many problems I came with and have learned so much from her about diet and my body. I recommend it highly!